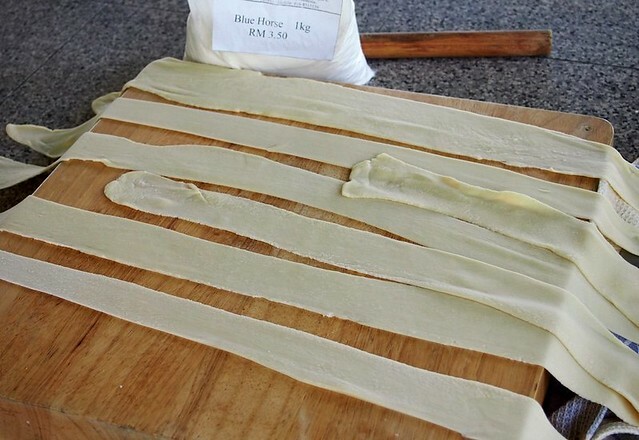 Biang biang noodles, also known as 'belt noodles' because they are as broad as belts. What noodles I hear you say? I've never heard of biang biang noodles either. I asked two friends from China if they've heard of biang biang mian and both said they've never heard of it too. 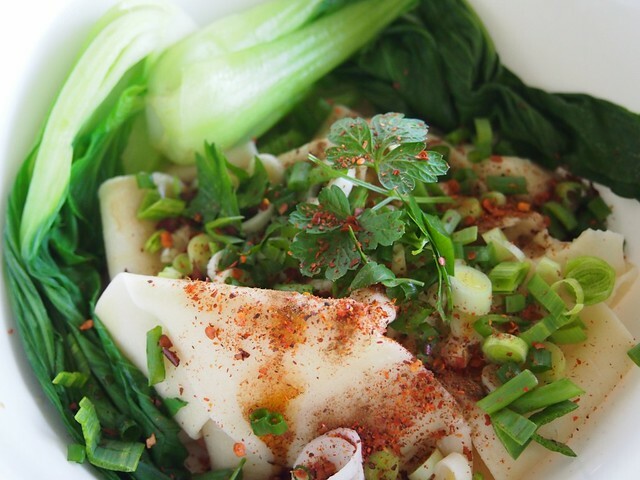 Biang biang noodles are the specialty noodles of Shaanxi, a province in the middle of China which has Inner Mongolia as its northern neighbor. Shaanxi is one of the cradles of Chinese civilisation and Xi'an, the capital, was one of the 4 ancient capitals of China. 13 dynasties established their capital cities in Shaanxi. If that still doesn't orientate you, how about the Silk Road? Surely you've heard of the terra cotta warriors? 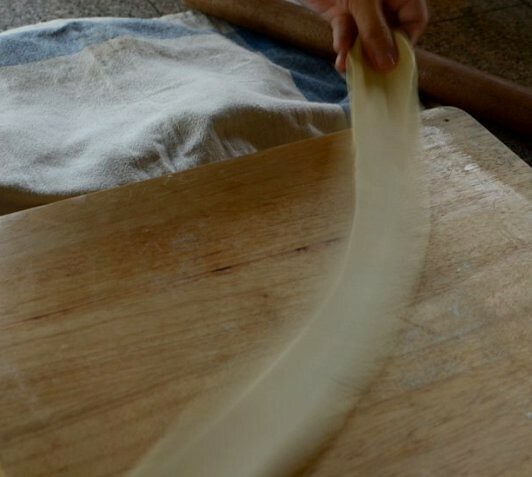 There are two stories to the origin of biang biang noodles, noodles that are so wide that they are also called 'belt noodles'. One is that the name came from the sound of the noodles being flapped and stretched. The other story is that the word was invented specially by an Emperor or a premier for the noodles. I certainly didn't hear a "biang biang" sound when I whacked the noodles on the counter. Since the word 'biang' doesn't exist in the Chinese language (I asked Hub and he has never seen or heard of this word) and is only used to mean the noodles, I think the second story probably holds more water. The word biang is made up of 57 strokes, the most of any Chinese character although Chinese language experts don't even accept biang as a Chinese character. If you think 57 strokes is not a big deal, try writing it. 100 times, like how your Chinese teacher used to punish you. 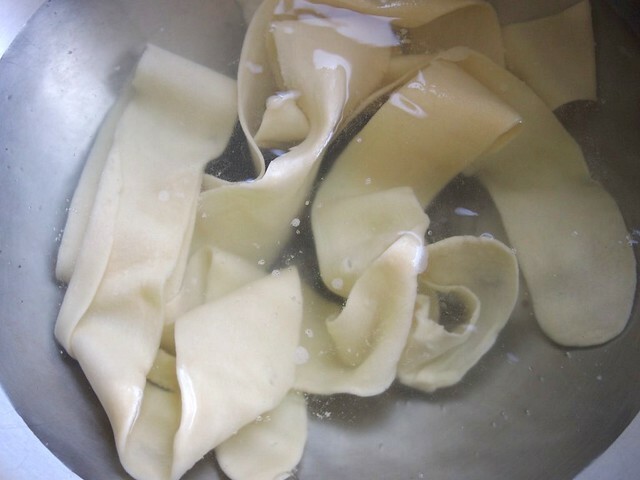 I made biang biang noodles 4 times this week and frankly, I'm sick of them. The first time was a big success. The family loved the noodles. Hub said it tasted of China and Ming wanted the recipe but I didn't like how the noodles had splits and frayed edges. I had used plain flour and thought that a stronger flour would improve the strength and texture. The next day, I made the dough using a 50-50 mix of plain flour and hi-protein bread flour and the noodles were hard to stretch even though I had let the dough rest for 40 minutes. Worse, the noodles were difficult to eat because they were so broad and chewy. The third time I made the noodles, I left out the egg. I wanted to see how the texture turned out but without the egg, the dough didn't smell as good so I threw it out instead of cooking it. The fourth time, I went back to plain flour and egg but used less water. I think it was the right texture. I said I think because I've never eaten biang biang noodles before so I can't compare. If, like me, you love noodles and you aren't fixated on the same old wonton noodles or chow mian, do make biang biang noodles for a change. The noodles are slippery-smooth and unusually broad, broader than papardelle, so that eating them requires you to open your mouth very wide and chew like a caveman but the complex mix of spices (chili flakes, 5-spice powder, cumin powder, Sichuan peppercorns), herbs (coriander, garlic leeks, spring onions) and seasoning (soy sauce, peanut oil, sesame oil, black vinegar) makes the noodles totally delicious despite being a simple bowl of poor man's noodles. I can't imagine the emperor eating biang biang noodles though, not because they are humble noodles but because I can't imagine the emperor opening his mouth really wide and gobbling like the commoners. The recipe below is adapted from a wonderful blog, beijinghaochi.com, which unfortunately is strickened with malware recently. 1. Mix 2 1/4 cups plain flour, 1 egg, 1/2 t salt and 150 ml water into a dough and knead well until smooth. You may need to add another 1/4 cup flour as you knead to make a firm dough. Cover and let dough rest 15 minutes. 2. Cut into 6 portions and coat lightly with sesame oil. There's no need to flour the working surface if the dough is just right. This dough was my first try and I floured the working surface, just in case. 3. 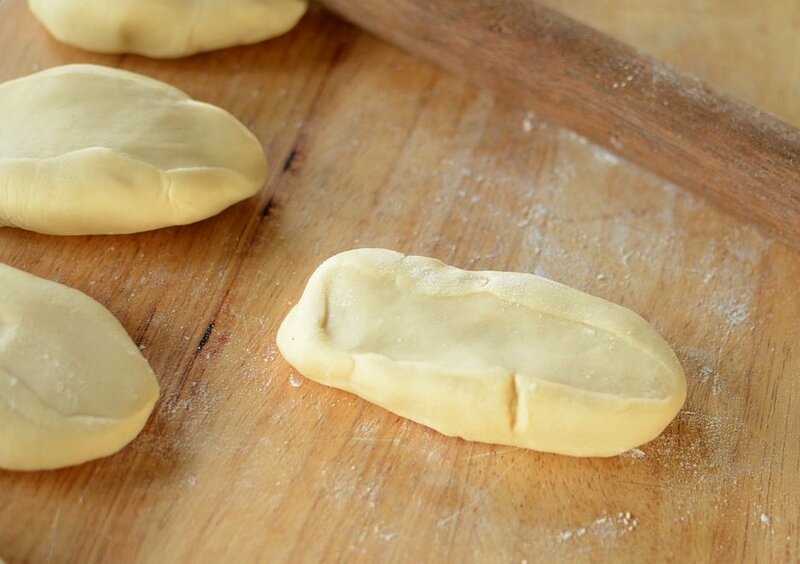 Use a rolling pin to roll the dough into a long 'tongue' of about 1 foot/25 cm. 4. Hold both ends of the 'tongue' and flip up and down, pulling and stretching your arms wider as you go. On the downstroke, slap the dough against the working surface to thin it. If you are good, you can get an evenly stretched piece of 'belt' about 1.5 "/4 cm wide. The noodles taste better thin but it's up to you. 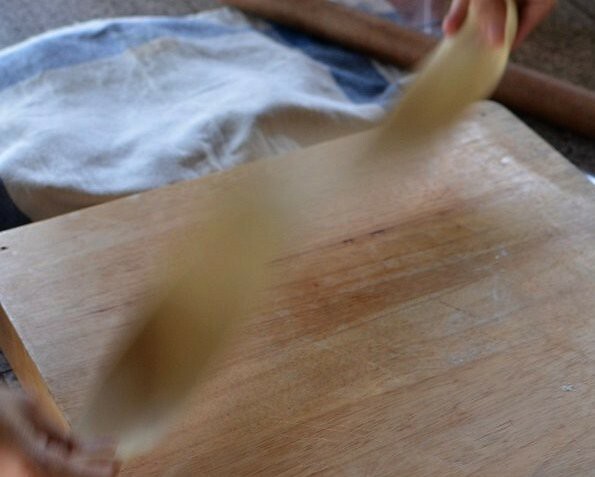 Do not cheat early on by rolling the noodles out using a rolling pin, because you'd get noodles so broad that they look like those funny-looking bands some men have to wear on their wedding day. Cummerbunds I think they are called. 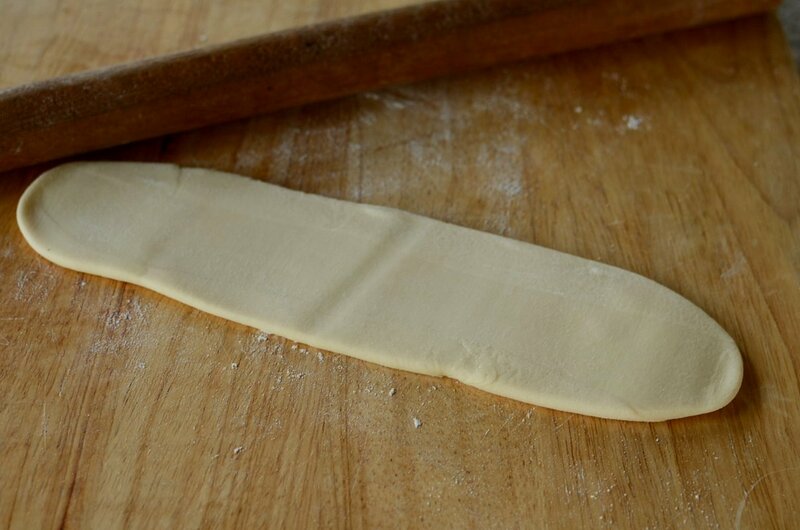 To avoid making cummerbunds, you can use the rolling pin to make the noodles evenly thick after they have been stretched. 5. 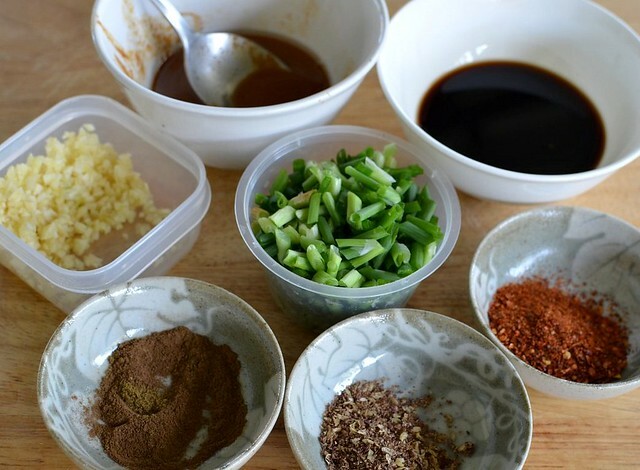 Assemble the toppings, sauce and seasoning. 6. 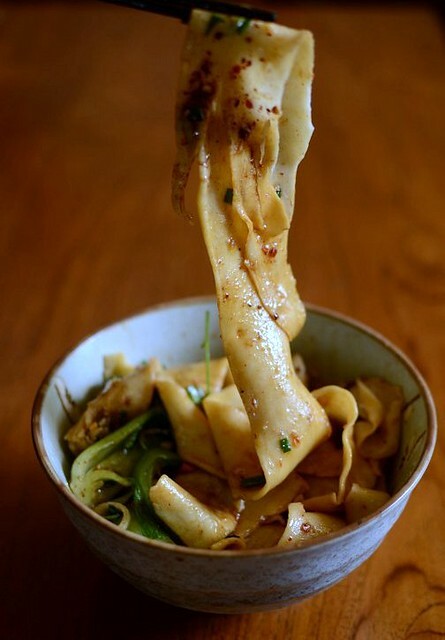 Cook the noodles in a pot of boiling water for a couple of minutes and scoop out with a slotted ladle into a big bowl. 7. 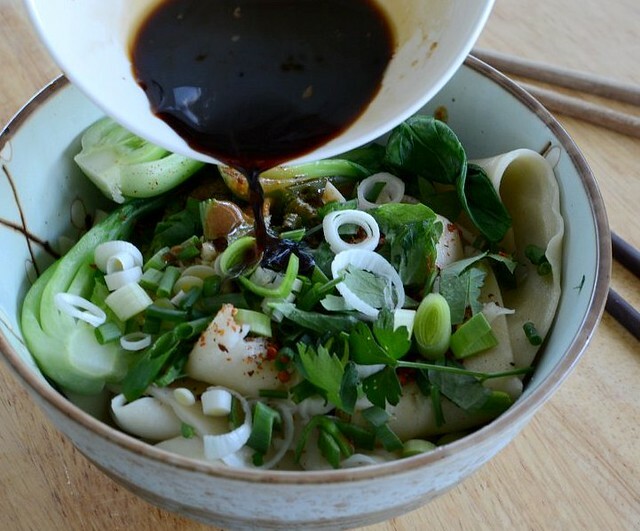 Quickly top the noodles with the blanched veg, the toppings, seasoning and sauce. Heat the peanut oil up. 8. Pour boiling hot peanut oil over the toppings, scalding the onions and seasoning to release the flavors. Mix and gobble up. Hi Terri, just a thought - how about using plain flour with boiling water? omg this looks SO GOOD!! 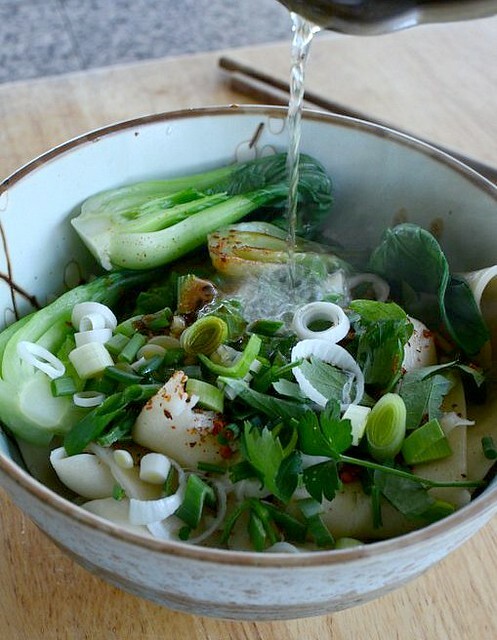 I am the biggest noodle fan, and thank you for posting the recipe too! This reminds me a little of chilli pan mee for some reason but i think i would prefer this one! U made me hungry liau n I m trying stay off carbs. Those noodles look wonderful - a little thicker and wider than I've usually found - perfect for me -yum! michael888: i dunno...don't think it'll work. dough made with hot boiling water (like tt for scallion pancakes) is rather 'dead'--doesn't stretch, just breaks. katherine:me too, noodles over rice anytime. love your clothes, shoes (oh, those black louboutins 100mm!, bags...!!! michelle: what is chili pan mee--oh wait i've just googled it. omgoodness, chili pan mee looks awesome!!! dang, now i wish i'm in kl! where's the best chli pan mee in kl pls?! nee: high 5, am staying off carbs too! told my maid tt i want to loose weight b4 cny and she said "tidak boleh lah missus lama sudah mahu kurus tapi susah.." i'm going to show her!